Some of us may never face the frustration of trying to make sure our medical records get from one care setting to the next, but for many it’s a recurring nightmare of red tape, phone tag, paper trails, and questionable fees. Unfortunately, the battle often happens in the worst possible moments - when you, or a loved one, is facing a frightening health crisis. We’ve experienced that nightmare personally and created OneChart to eliminate it. The doctor you visit, the specialist you see, the hospital you stay in will all change. The one consistent element in your care experience is you. Shouldn't your medical record simply follow you? 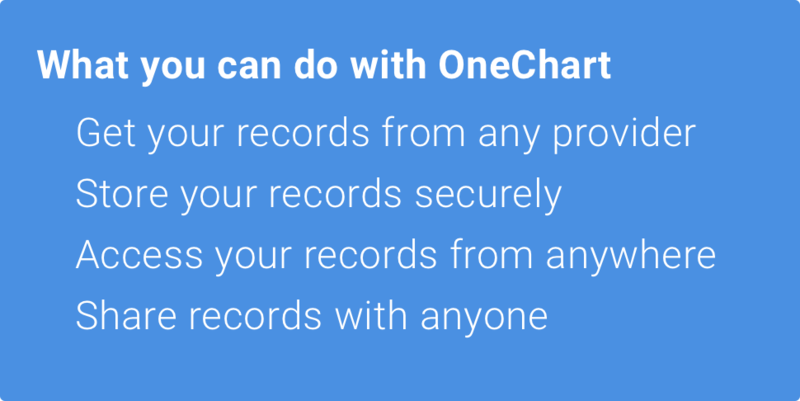 With OneChart, you own your data and your data goes where you go. You, not the health system, the insurance company, or anyone else, decides when, where, and with whom your data is shared. The ability to sign up for the service, view records shared with you, and store your own records will always be free. The platform incurs costs only when records are requested and OneChart staff members follow up with provider organizations to ensure that records are returned in a timely manner. OneChart is designed to operate at minimal cost to the individual. As a result, OneChart will be made available later this year for $2.00 per month or $24.00 per year. As development continues towards our initial release, we are making the system available as a pre-release service to early adopters for $12.00 for a year of service. Early adopters continue to play a critical role of helping us shape the service to meet the current needs of patients can their families across the United States. Should you choose to participate, your feedback, comments, and suggestions will be extremely valuable. If you would like the early opportunity to take control of your own medical data, and help us improve the entire platform, get started by clicking Get Started above.